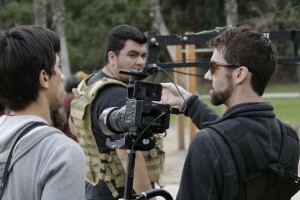 Music video production is one of many video production services Pixel Productions offers to our clients in San Diego. We are able to combine creative and writing teams with the technical side of film production, as well as collaborate with local filmmakers in San Diego in order to create professional, beautiful, and artistic music videos for musicians and artists. As the music industry changes, music video production is quickly becoming an important medium for artists to utilize in order to reach a broader audience and gain mass-market appeal. A single music video can catapult an artist from obscurity to fame. 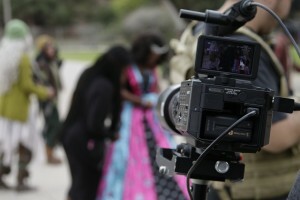 Pixel Productions recently worked on a music video for the song “Glitter Star” written and performed by San Diego musician and creator of Dynamite Doll Designs, Annaiah Jones. The first step in producing this music video was to work with director, Justin Burquist, to develop a captivating story concept that was both unique and followed the expectations Annaiah envisioned. Once the story concept was approved, writers at Pixel Productions wrote the script, created a shot list and storyboard, and started scouting for locations in San Diego to start the permitting process. Tidelands Park in Coronado proved to be the perfect match for this music video. Once pre-production was complete, Pixel Productions traveled on-location to shoot with our professional video production equipment and crew. We started at 7:00am on a Friday, at Tidelands Park on Coronado Island, with the sunny skyline of San Diego in the background. We used a team of professional filmmakers, a Sony F700 and FS100 to capture Annaiah as she transformed a sad shantytown of homeless people into a full blown dance party, with happiness and smiles galore. During magic hour, around 4:15pm, we set up to capture the biggest shot of the day – a dance sequence which involved eight performers dressed as homeless people. We started filming with the Coronado Bridge and San Diego Bay in the background, a SonyF700 mounted to a 15 foot jib, a SonyFS100 on a tripod as camera B, and a stereo for play back of “Glitter Star”. The performance was spectacular. Soon after, the sun went down, and we called it a day and packed up equipment. For “Glitter Star” we had the opportunity to film at two different locations; the first day we filmed exterior at Tidelands Park and the second day we filmed interior at Pixel Productions’ studio and sound stage. In studio, we designed a set, using vibrant colored fabric props, and confetti glitter to create a scene where Annaiah was in the center frame, singing up into camera, as glitter gently fell over her while she performed, wearing one of her custom Dynamite Doll dresses. Using the Sony F700, we sped up the frames to 60 per second to create a slow motion effect, and to catch the detail in the glitter as it fluttered down onto Annaiah. On day two, we filmed a choreographed ballroom dance with the performers from day one, Jaami and her crew, on the Pixel Productions sound stage. As the clock ticked closer to our wrap time, we prepped for the last shot: Glitter Cannon Trashcans! This scene involved compression canons, constructed by Paul Michael Hentschl, hidden inside three tin trashcans. Three dancers played the lids like drums, then removed the lids at the precise moment where the canons were released to shoot glitter into the sky. We filmed the glitter canons at 240 frames per second on the Sony F700; it looked phenomenal. By the end of our two-day shoot in San Diego, the whole cast and crew was completely covered in glitter; needless to say, we all became “Glitter Stars” that night. From a dance sequence in Coronado, to a Shantytown overlooking the San Diego skyline, to in-studio at Pixel Productions, we worked with Ananaiah to capture the various landscapes and beauty that San Diego has to offer. Music Video production is a great way for musicians to explore their other talents. Annaiah had a dream, and Pixel Productions helped her turn it into a glitter filled reality. Regardless of the genre of music, having high quality music video production is a must for any musician. It will brings artists closer to their audience and fans, as well as drive traffic to their official website. Each view, each play, and each fan is important for musicians in the highly competitive music industry, and having high quality music video production is equally as important. Check out some pictures from the shoot and follow Pixel Productions on Facebook and YouTube to see the final video.